We launched from the beach at Drumkinnon Bay beside the Maid of the Loch.With the backdrop of the snow covered Luss hills and the low angled November sun Loch Lomond was 'bonnie'. There were four boats from the DCKC, Andy and Bill sharing one of the club's new Venture Canoes. 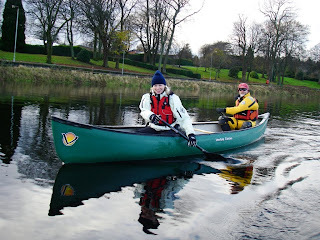 Making our way down the River Leven at Balloch, we had to portage around the barrage, fortunately many helping hands make light work. The River Leven in past centuries was industrialised with printing and dye works. It did run red with poisonous chemicals, but the fast-flowing river quickly moved them on, and cleansed the river bed. Thankfully all pollutants are long gone and water quality has improved from the open sewer it must have been. There are still a lot of houses and industries lining the banks. You can see that Andy & Bill have both been shopping at the same shop! - LOMO of Glasgow. The river was running high and the minor playspots were washed out. However this was an unexpected beauty! Apparantly a pipe on the river bed causes this wee stopper, it certainly was 'grippy' and you had to make sure that you were in control or a wee swim would have ensued. We made quick progress, apparantly the Leven is Scotland's second fastest-flowing river (after the River Spey) Our lunch spot was quite peaceful given the fact we were in the middle of Alexandria and Bonhill. We passed by the giant Ballantines building and were soon on a pretty stretch near Renton. In places you could forget that you were in the Vale of Leven. The escarpment in the picture is Lang Craigs on the Kilpatrick Hills above Dumbarton. Thr River Leven is a famous and popular river for trout and salmon, the local fishermen would be blazing mad if they knew that this seal was here! It was an odd feeling canoeing through a town. The river banks are neatly manicured. Passing the Dumbarton boatyards we canoed over some sunken boats. Dumbarton Rock is where we join the River Clyde and pick our exit spot. Second lunch spot was the castle car park. Do you wonder why the general public make a wide berth when they see us on dry land. The Clyde was on an ebb tide, but it was nothing compared to the speed of the water in the River Leven. The light was starting to fade, so after looking at the deep channel markers, we made our way back to Dumbarton and luckily found a not too muddy exit point. It was about a 3.5 hour trip from start to finish, and this included 2 lunch stops! The open canoes are good fun. Andy & Bill are saving their pocket money, they've heard the siren call that draws people to the water in their open canoe. Cycled it recently and was curious to see if it was a popular kayak/ canoe river due to its fast currents. Looks a good scenic outing.